On Sale Now! Free Shipping Included! 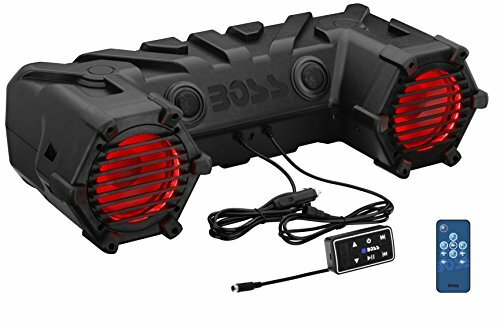 Save 5% on the BOSS Audio ATV30BRGB Bluetooth, Amplified, Multi-Color Illumination, ATV/UTV Sound System, Weather-Proof Marine Grade, Bluetooth Remote, 12 Volt Application Friendly by BOSS Audio at Kart Racing Network. MPN: ATV30BRGB. Hurry! Limited time offer. Offer valid only while supplies last. Hit the trails on your ATV, tailgate or go camping with your playlists on the Boss Audio ATV30BRGB Weatherproof Powersports Plug and Play System. Hit the trails on your ATV, tailgate or go camping with your playlists on the Boss Audio ATV30BRGB Weatherproof Powersports Plug and Play System. Compatible with any 12V power source, you can blast your tunes through the built-in 450 Watt Max Power Amp, 6.5" Poly Injection Cone Speakers and 1.5" High Performance Dome Tweeters. Hook the Audio Output of your Smartphone or MP3 Player to the Auxiliary Input and charge them with the USB Charging Port. Bluetooth Stream and Control lets you play and control your favorite music apps like Spotify and Pandora. Control Play, Pause, Track and Volume with the IPX5 Rated Weatherpoof Bluetooth Inline Multifunction Remote. Multi-Color Illumination Options let you change the Color of the Speakers with the Wireless Remote. The ATV30BRGB is Fully Marinized to help provide protection against the elements. Add more fun and music to every adventure with the Boss Audio ATV30BRGB. Plug and Play for Easy Installation, Ideal for ATV's, UTV's, Side by Sides and Tailgating!